A special trial court here on Friday granted last opportunity to former Gujarat BJP Minister Maya Kodnani to present party President Amit Shah as her defence witness in the Naroda Gam massacre case during the 2002 communal riots in the state. She has been given time till Tuesday. Kodnani, former Minister for Women and Child Welfare in the Narendra Modi government in the state, is a convict in the mass murder of 97 Muslims in Naroda Patiya, an area adjoining Naroda Gam where 11 people were killed on the same day — February 28, 2002. 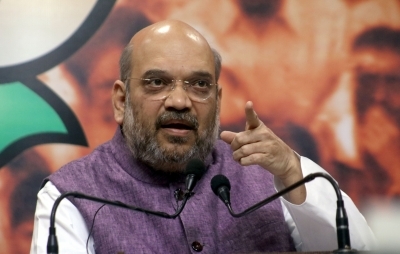 After several adjournments when Kodnani, a key accused in the Naroda Gam case, sought more time to serve summons on Amit Shah to establish her alibi, the court had asked her to present Shah latest by Friday. In all, she had presented 12 others in her favour earlier. They included her husband Surendra Kodnani, former Deputy Mayor and Bhartiya Janata Party corporator Dinesh Makwana and former BJP MLA Amrish Govindbhai Patel. The special sessions trial court of Justice P.B. Desai on Friday gave Kodnani the final ultimatum till Tuesday and stated there would be no further adjournment after that. Last month, the Supreme Court issued an order to the special trial court to wrap up the hearing in the Naroda Gam case within four months. The former Minister’s advocate had on Monday informed the court they she needed more time to be able to contact Amit Shah. In her application to the court, she said since Shah was not “reachable due to his busy schedule, it is difficult to decide as to which address the summons be served to him”. Kodnani is among the 82 accused on trial in the Naroda Gam case. In 2012, she was convicted on similar charges and sentenced to life imprisonment for her role in Naroda Patiya massacre, where she was termed a “kingpin”. She and 31 other convicts have challenged the verdict in the Gujarat High Court which concluded its hearing on August 30 and reserved the verdict.